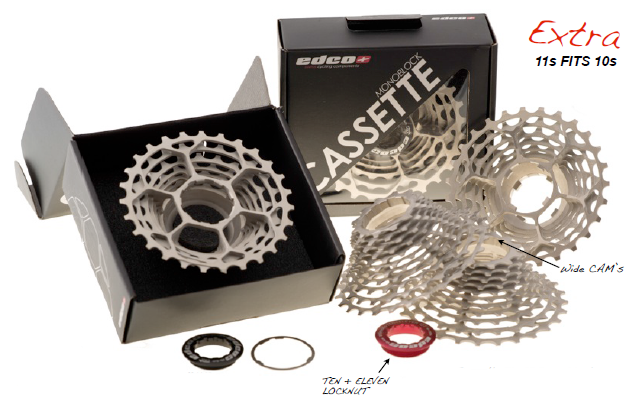 The unique Edco Monoblock Cassette features wide CAMs, and when used in conjunction with our special “Ten+Eleven” locknut (sold separately) you can also fit an 11 speed cassette to a 10 speed body. We now also offer a 12-speed Campagnolo option. For further information and to order please contact us or call 01970 626777. 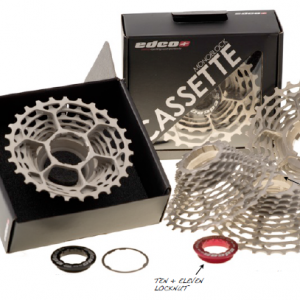 IMPORTANT NOTICE – The two-step design on 7801 cassette bodies that were issued by Shimano in 2010 are not compatible with the EDCO multisys cassettes. The taller spines on this body does not allow any cassette to be used apart from Shimano Dura Ace 10 speed from the same period.